Large bedrooms allow for more sleeping space. The master has a king while the guest has a queen and a twin bed. Pet Friendly, High speed wireless Internet also ask about free clay court tennis time at the South Beach racquet club. TV's in every bedroom. Owners have recently remodeled the living areas, dining room, sunroom and kitchen. Have a look at the new open concept in the kitchen. 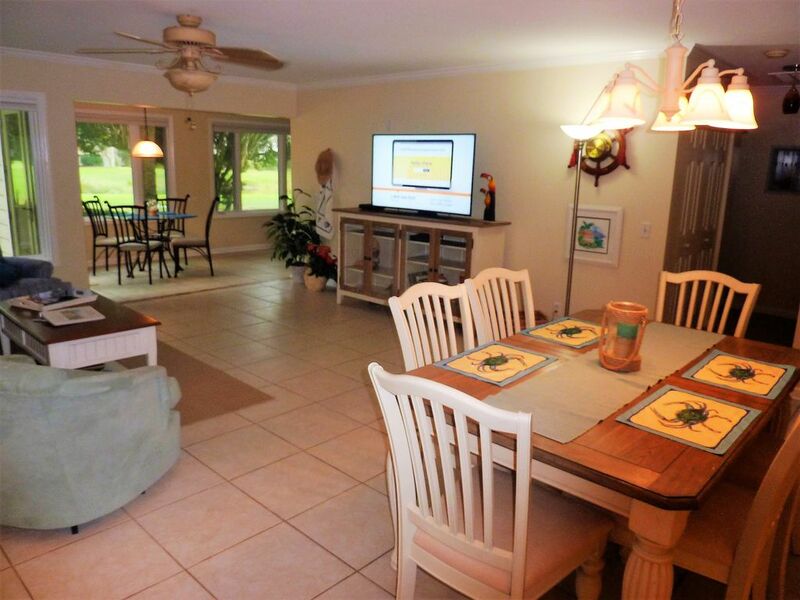 Located a 5/minute walk from two golf courses and Sea Pines Beach Club. From beach accessories to a modest video library, this villa provides all the amenities to maximize your vacation/getaway. Centrally located single level villa features a newly constructed all seasons room, living/dining great room, and fully-equipped kitchen. Pets Allowed, No Smoking. Guests will enjoy miles of leisure trails, biking to Harbor Town and the South Beach Marina, tennis, Golf, Beach, pool, Horseback riding, and shopping. Free Fitness Center pass includes access to an indoor pool, spa and health club facilities. Outdoor community pool is located about 5 minutes away at South Beach Marina. Family passes are $15 per day. Free clay court tennis at South Beach Racquet Club after 12 daily. Fully equipped kitchen. All linens provided including beach towels. Beach chairs are also included. Good unit in a great location. Great communication throughout the process made it very simple to get in and out of the unit. Owner was very friendly and easy to talk with throughout. The unit is pretty well kept up. The furniture and amenities will soon need to be refreshed, but no problem right now. I like to have my VRBO's a little better stocked with "basics" like kitchen spices, and coffee/tea, shampoo, soap, TP, paper towels, laundry soap,etc. They had some of this, but a bit more would make a nicer experience. Needed to be out of the unit by 9am which is a bit early, especially when they ask to strip the beds, start the laundry, put dishes in dishwasher and simple clean up. But, these all take time in the morning...and of course we pay for a cleaner. Again, not a big deal, but just a comment worth noting. Overall it was very enjoyable and i would recommend the unit to others. Just some simple fine tuning could make it an even better experience. Thanks for letting us rent your nice home. perfect location and a clean, cute place! We have stayed in Sea Pines many times over the years and love the area. This villa is centrally located so my teens were able to bike to Harbourtown, the beach, tennis, the stables, and the Salty Dog! We loved the clean, updated villa and the fact that we could take our dog with us and walk on the beach every day with her. The bottle of wine was a nice, welcoming touch, and we had fun playing Hilton Headopoly! We would definitely stay here again! This was a last minute booking - 48 hours prior to checking in, with that being said I did have some concerns with the reservation/accommodation. After booking, I was told by Jessica (property manager) that the Sea Pines weekly parking pass would need to be purchased at gate ($20) because of the late booking. It occurred to me during our stay that I could/should have been offered the option of purchasing a day pass ($8) on our arrival day and management or housekeeping could have dropped off the weekly pass at our condo the next day or we could have picked up at their office. When I mentioned to Jessica at check out, I was told that could have worked and next time, if I booked again, they would accommodate that request. On our arrival day, I had to reach out to Jessica as the check in time for the condo was 4PM and at 4:40PM I still had not received the access code. I did question Jessica about the description of the property on VRBO as it states that the condo has had a "total remodel" when in fact both bathrooms have not been remodeled. Jessica confirmed they have not been remodeled but the owners do have plans to renovate them. I have gone back on VRBO to see if the condo description has been updated to reflect the true condition of the condo since we checked out but it has not, which is disappointing. Bottom line... the location is wonderful but next time we will book elsewhere. I have gone ahead and updated the property description to reflect all the areas of the villa that have been remodeled. With all the beautiful work that was done I guess we got carried away with our description of "total" remodel. The condo was just as expected clean and well stocked. Perfect for pets and the bottle of wine was a lovely touch. We had no problem, but large people might not fit in the shower. Overall we would definitely recommend. Wonderful villa in a great location! It was so nice to be able to enjoy our pet while vacationing, fixing breakfast together followed by blissful bike rides. Evening beach walks ended our adventurous days. A more affordable pool option would have been nice. I highly recommend this villa! Beautiful villa right on 10th hole of golf. Beautifully decorated with everything you need. Spacious for a family. Dog friendly. Can't wait to return. During peak season most changeovers are either Saturday or Sunday, but there are exceptions. A departure cleaning is included with the reservation. Please note your rental agreement's damage authorization clause. Rates are subject to change until reservation is confirmed. Guests are encouraged to obtain traveler's insurance.